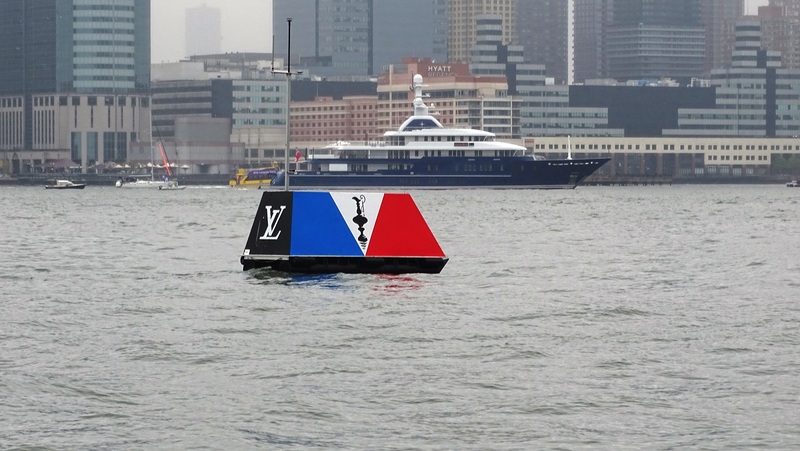 After almost a hundred years – 96 years to be exact – the America’s Cup returned to New York as part of the Louis Vuitton America’s Cup World Series. It was an exciting time and I was fortunate to be part of it as a stake boat at the finish line marking the course boundary. I must say, it really doesn’t get better than that in terms of front row seats – except it was quite the challenge! Anchoring in 60 feet of water with silt at the bottom of the river, combined with a 3.5 knot current, gusts up to 28 knots and prop wash from large ferries spinning just 40-50 feet from us, didn’t make it easy holding the GPS position we were given by the race committee. I ended up having to keep the boat in idle forward, sometimes a tad more to keep Sedna in position. However, despite all that, it was wonderful to be on the water and witness first-hand the America’s Cup back in New York. Rewinding a bit, it was an exciting week here at Liberty Landing Marina as the containers arrived, the technical village was set up and the boats were assembled. I learned quite a bit about the boats during that week, including that the back part of the boats were bolted on as the 45 feet length of the hulls are too long for the shipping containers. Also, I was able to see fist-hand how the boats are assembled on land, picked up by a crane and lifted into the water (see photo page). Friday was designed as a practice race day and a dry-run to ensure that all stake boats and marshal boats knew their positions, the marks could be anchored correctly depending on the wind direction and the race directors could communicate with everybody involved. All-in-all, it went well despite having drizzle, fog and little to no wind. What did not disappoint however, was the strong current in the Hudson River, and many boats including the AC 45s, the anchored stake boats and the marshal boats were struggling to cope with the current. And, it wasn’t just the boats either. At one point, one of the finish mark’s anchor didn’t hold and we watched it drift right by us. It was a good practice day to get the kinks out! The official race days were Saturday and Sunday, and although Saturday was a disappointment in terms of wind, the teams put on quite the show for the estimated 75,000 people lining the promenade of Brookfield Place and Battery Park. 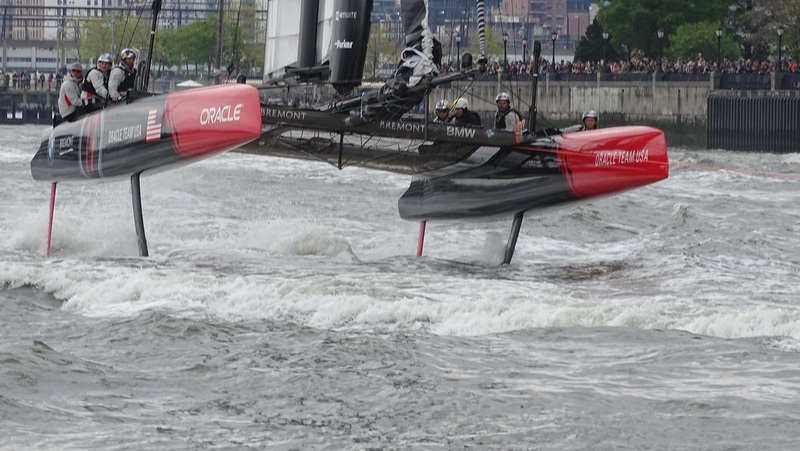 Each team’s support boats towed the AC 45s, bringing them up high on the foils for a ‘fly-by’ for the crowds. This was done perhaps only a couple hundred feet away from the seawall, and the throngs of spectators loved it! It was their first chance to see these ‘Formula 1’ racing catamarans up close and personal. At Sunday morning’s race briefing, it looked like it would be a fantastic race day with plenty of thrills and spills. Alas, the wind did not cooperate as much as the teams and racers would have liked. Because of the location right off of lower Manhattan, the winds were quite gusty and variable – spoiled by the skyscrapers along the waterfront. Needless to say, due to the strong adverse current and the gusty and variable winds, winning the individual races came down to a certain extent to those teams who positioned themselves the best for the gusts without being swept out of bounds by the swift current. Having said that, there were some exciting moments with the cats coming up on foils or lifting suddenly in the wind gusts. The location was not the ideal place to hold the race from a wind perspective. For those of us who sail regularly here, we know that off of Governor’s Island or Robbins’s Reef by the Statue of Liberty is much more consistent in terms of wind. 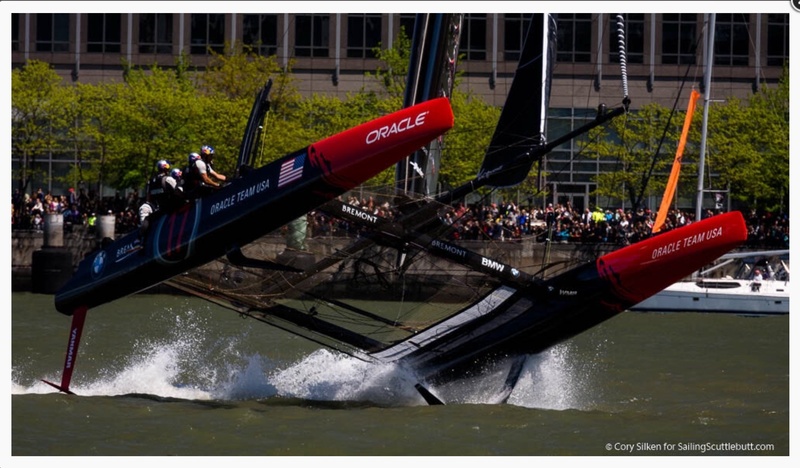 However, in terms of drawing a sizeable crowd and introducing a large number of people to sailing in general, and the America’s Cup in particular, the Battery Park location is ideal. On Sunday, there was an estimated 100,000 people, and it was by far was largest crowd I have ever seen along the seawall for events (excluding the Macy’s fireworks) since I’ve moved to the New York area. Although sailing purists have derided the logic of holding an America’s Cup venue in New York City, I would like to see it come back. 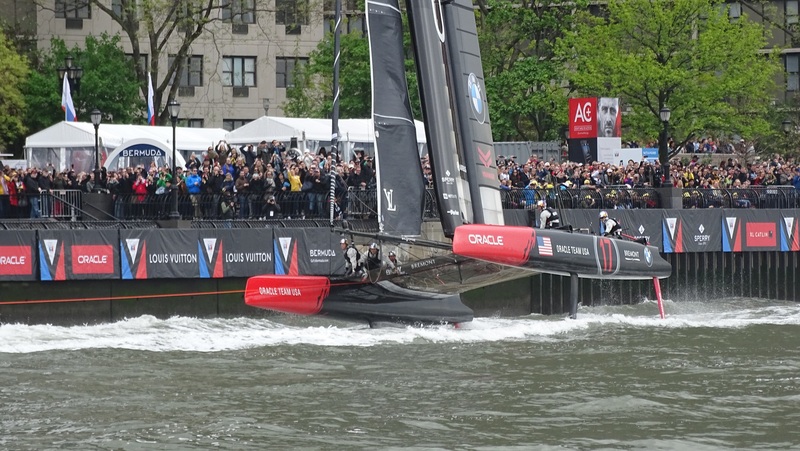 From a spectator perspective, I think it was very successful and if the NBC TV broadcast on May 21st pulls in sizeable ratings, then we could see the LVACWS return to the City in a few years. fingers crossed. This entry was posted in sailing and tagged America's Cup, foiling on May 16, 2016 by Greg Kyle (ChefonaBoat). As sailors, we like to have as much insight into the weather as possible. Some wind is good, too much is not as nice, and being becalmed is quite frankly, not fun. Close to shore, we can check the weather on a phone app, or listen to the weather radio, but those options are not available out at sea. Being able to understand cloud formations and what they could indicate in terms of weather can be a big help for sailors. Clouds not only show the stability of the atmosphere, but they also indicate where you may be relative to a weather system (high or low pressure, warm or cold front) and whether that system could bring rain or changes in the wind strength and direction. At first it can seem confusing with what looks like so many cloud types – and indeed there are hundreds – but these myriad cloud types can basically be grouped into ten main cloud groups (genera) which are divided into three types; cumulus, stratus, and cirrus. They are then distinguished further by the height at which they are found; cirro (high-level clouds), alto (medium-level clouds) and stratus (low-level clouds). There is only one other major cloud distinction and that is nimbus, which means precipitation. Cirrus clouds are wispy in nature and are formed because of thin layers of ice crystals in the upper atmosphere (above 20,000 ft). They generally get their start from ice crystals being carried away by the jet stream from the top of thunderstorms or tropical cyclones. 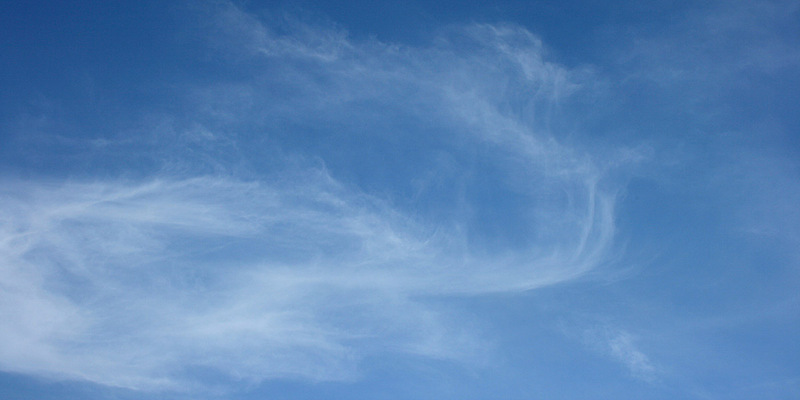 Cirrus clouds by themselves, are a sign of fair weather, “the higher the clouds, the finer the weather.” However, if cirrus clouds are combined with other types of high-level clouds or a backing wind (anticlockwise direction from west to south), they could indicate approaching bad weather. “Mares’ tails and mackerel scales make lofty ships carry low sails” refer to the combination of cirrus and altocumulus clouds. 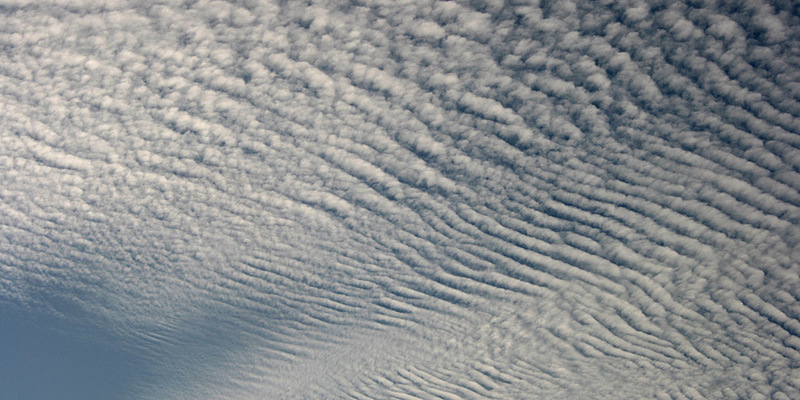 These high-level white, fleecy looking clouds can also appear as thin wave-like sheets. Cirrocumulus clouds are formed by a shallow pattern of upper-air convection and can sometimes be an indicator of an afternoon or evening thunderstorm. If cirrocumulus clouds are increasing from the west, and begin to thicken into altocumulus clouds, it is a generally an indicator of an approaching warm front and the possibility of rain within 18 to 36 hours. These form as cirrus clouds thicken. They are often distinguished by a thin hazy sheen or veil in the sky. At times the cirrostratus clouds may not be readily visible, but there will be a halo around the sun or moon as the light passes through ice crystals in the upper atmosphere. “When halo rings sun or moon, rain’s approaching on the run” is another old mariner’s proverb and is a good sign of approaching storms within 8 to 24 hours. Keep an eye on the barometer and the faster it falls the sooner the approaching depression will arrive. If the barometer remains stable, chances are the front will pass to the north or south. These mid-level clouds can be gray or blueish and appear as sheets or layers with few features. 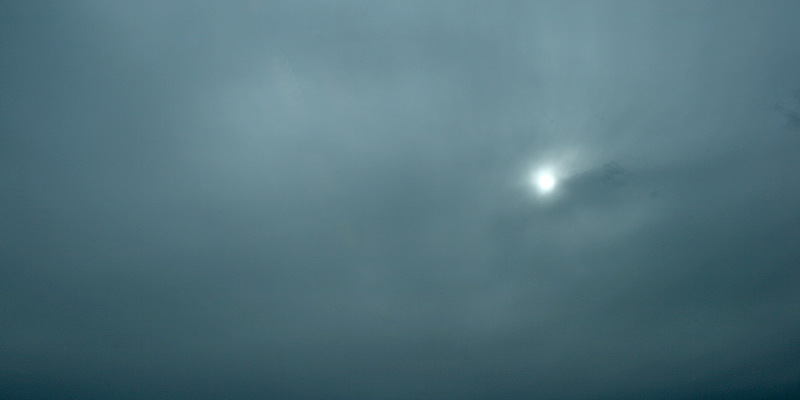 Although the sun can be often be seen weakly through these clouds, some layers can be opaque. These clouds are formed through a combination of ice crystals and water droplets. Out at sea, thickening altostratus clouds generally indicate a warm front approaching and the possibility of strong winds and waves. A good rule of thumb, is the length of time between cirrus clouds arriving to losing the sun (with altostratus clouds), is usually about equal to the time from losing the sun to rain falling. 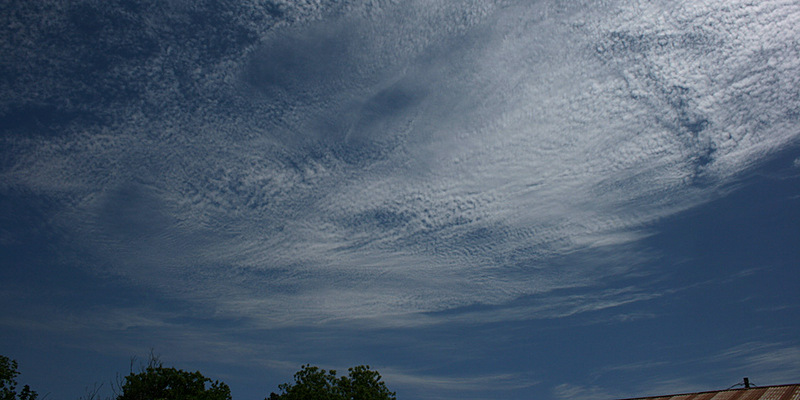 Appearing as white or gray patchy sheets or layered clouds, altocumulus clouds are the most common mid-level cloud type. They can also appear as heaps or rolls of clouds. Typically these clouds form as a warm air mass is pushed up by an advancing cold front (think of a wedge as a cold front advances). These clouds are the “mackerel scales” in the mariner’s proverb. When they are accompanied by high-level cirrus clouds, it is a good indicator that a front could pass within 6 to 8 hours. Ahead of a cold front, winds typically back (move anticlockwise). Although classified as a mid-level cloud where they typically begin to form (often from altostratus clouds), their base is actually found at low altitude. 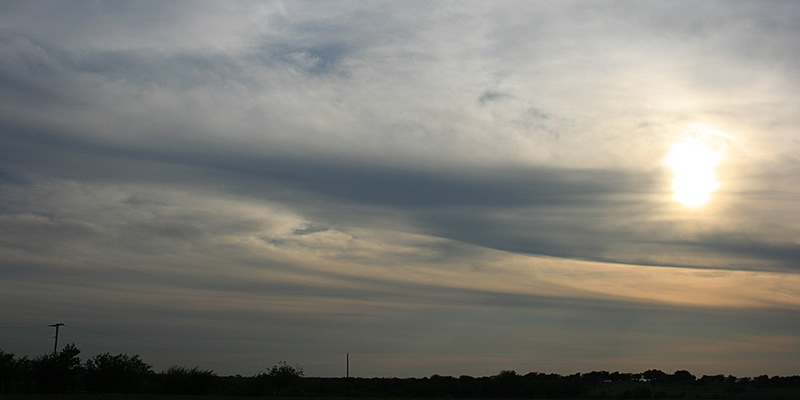 These clouds are distinguished by a thick, solid appearance, sometimes with small cloud ragged fragments (scud) below. Nimbostratus are found along warm or occluded fronts and are associated with periods (can be days) of moderate to heavy rain (or snow) over a wide area. 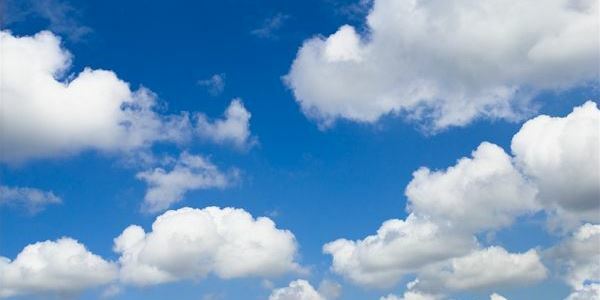 Known as fair weather clouds, cumulus clouds appear as white, fluffy clouds, similar to cotton balls or cauliflower. They are formed by warm air rising and condensing as it cools. 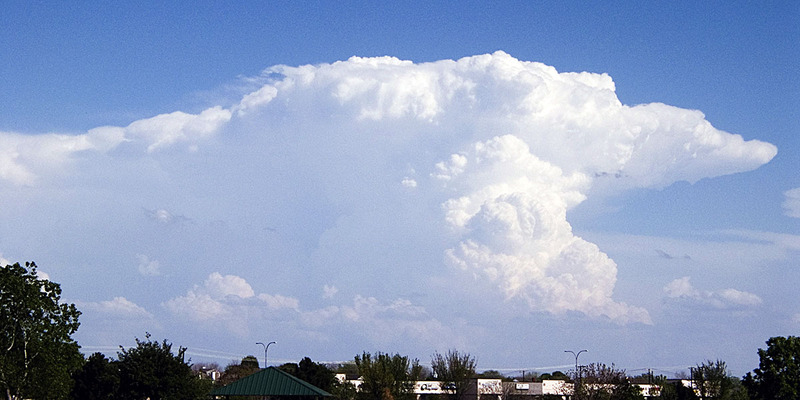 Although generally associated with fair weather, cumulus clouds can sometimes continue to grow and turn into cumulonimbus clouds or thunderstorms. Although on land, cumulus clouds tend to form in the early morning and disperse by late afternoon or early evening, at sea, cumulus clouds tend to be strongest in the late hours of the night. 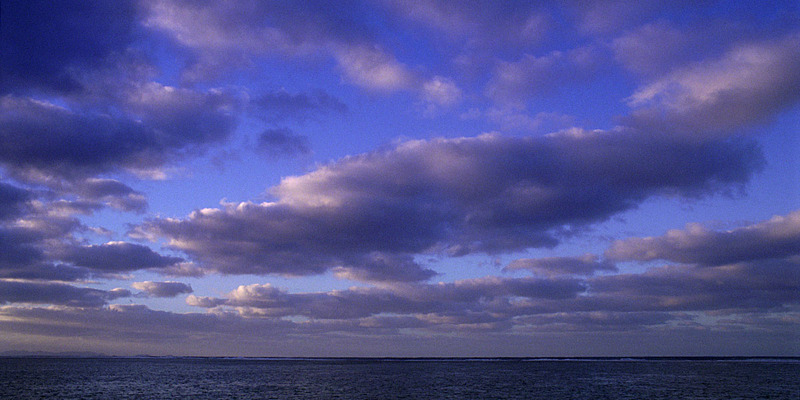 For sailors, larger cumulus clouds can be asociated with gusty and shifting winds around the clouds. These clouds are low-level clouds identified by their grey or whitish color and often appear as rounded clouds or clumps which can be joined together in layers, or form rows of clouds. Stratocumulus clouds can be found in all types of weather conditions. 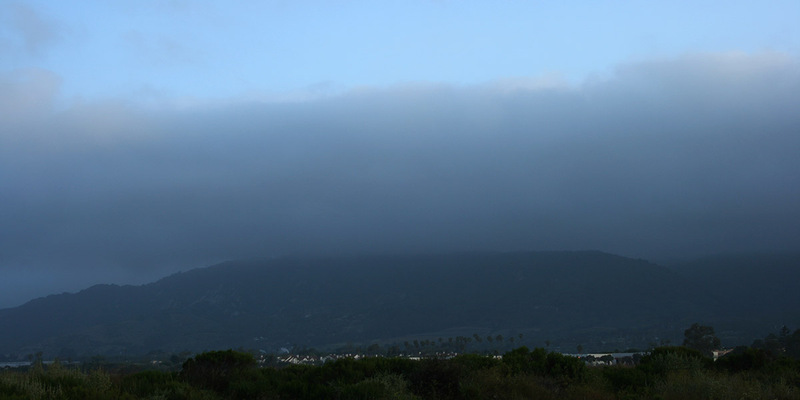 These clouds are very low-level, and can often appear as fog or mist at ground or sea level. 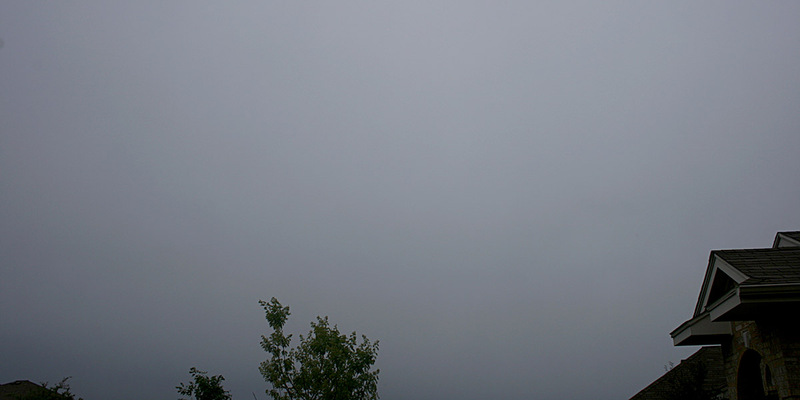 Stratus clouds are identified by their grey, uniform appearance. Although they can appear as dark uniform clouds, similar to nimbostratus clouds, they are not as thick vertically, thus do not produce any meaningful precipitation. Cumulonimbus clouds begin as fluffy cumulus clouds which expand as updrafts carry warm air aloft where it cools and condenses. Cumulonimbus clouds are your classical thunderstorm and are distinguished by the height it reaches and sometimes the appearance of an anvil top. The good news is that these thunderstorms tend to be localized and are not typically associated with long-lasting low pressure systems and sustained winds. The disadvantage is that the winds can be intense in the vicinity, especially with the downdrafts associated with a shelf cloud preceding the thunderstorm. To understand the impact of cloud types on sailing weather, it’s also helpful to have an understanding of warm and cold fronts. Without going into too much detail in this post (indeed, chapters have been written about this), warm fronts tend to be preceded by cirrus, then cirrusstratus, altostratus and finally nimbostratus clouds which then bring the rain. As the warm front approaches winds begin to increase and back (changing in an anticlockwise direction), and barometric pressure falls. As the warm front passes, winds veer (changing in clockwise direction) and pressure stops falling. After the passing of a warm front, wind direction tends to remain steady. Cold fronts tend to move more quickly (sometimes more than twice as fast) than warm fronts and are thus generally associated with higher surface winds. As the cold front passes, winds can veer suddenly and are often accompanied by squalls, and lines of cumulonimbus clouds (thunderstorms) can form. Pressure will typically rise quickly. Behind the cold front, winds can be quite strong and gusty. This is just an introduction to cloud formations and the impact on weather for sailors. For those who are interested in expanding their knowledge of meteorology for sailors, there are a number of great resources. The Royal Yachting Association (RYA) has a great book on weather from a sailor’s perspective. North U (of North Sails) also has a good book and CD-ROM. The National Weather Service (NOAA) offers an online weather course, as does the COMET Program, which is operated by the University Corporation for Atmospheric Research (UCAR). This entry was posted in Weather and tagged clouds, cold fronts, depression, meteorology, warm fronts on January 4, 2016 by Greg Kyle (ChefonaBoat). All too soon after returning from Nova Scotia it was time for the annual Around Long Island Regatta, a 190-mile race that starts near Rockaway Point on the ocean side of Long Island, goes up the south coast, rounds Montauk Point and ends off the breakwater in Hempstead Harbor near Seacliff Yacht Club. For many sailors, this race is a ‘rite of passage’ as it can be their first time sailing on the ocean. It may be a coastal race with the Long Island coast rarely more than a few miles away, but the ocean swells and waves have caused many a boat to drop out over the years either from crew seasickness or battered boats. In addition to having Suntex Marinas as our lead sponsor this year, we were also happy to have Landmark Hospitality’s Liberty House Restaurant as one of our other sponsors (a great way to have delicious five-star meals on board!). There were a few new crew members on this race. In addition to our core crew of Paul Donato, Susan Paul, Amir Elmallah and myself, we were joined by some Suntex Marinas tenants. That included Moochie Corrado who was with us on the Annapolis to Newport Race, John and Michele Jerger who had recently purchased a boat in Florida and sailed it up to Liberty Landing Marina, weathering some fierce Atlantic storms along the way, and Jeannette Lenoir, a journalist from upstate New York. It was a blustery day at the start of the race, with winds blowing between 20-25 knots and seas of 4 to 6 ft. This made for some ‘fun’ positioning prior to the start, but we had set ourselves up well and had a great start, crossing the line with the front of the pack. Settling in, we quickly headed east along the coast, passing Jones Beach and Fire Island in short order as the strong beam winds (blowing from the side) helped propel us quickly up the coast. There was a low that was forecasted to cross the fleet by early evening and it was shaping up to be quite the storm – with a well-defined squall line on radar! Looking back, I could see a shelf cloud (a low, horizontal wedge-shaped cloud at the front of thunderstorms) approaching us. That shelf cloud signaled a strong storm ready to hit the fleet, and we could see the heavy rain below it as well as seeing flashes of lightening through the clouds. There was a constant rumble of thunder. With our sails reefed, we were ready for the heavy winds often associated with this type of weather and we were not disappointed. We could see other boats behind us rounding up and struggling as the winds hit. We were hit as well, but having reefed early, we managed to maintain course – for the most part. There were times Sedna also rounded up even with the helm hard over as there were several gusts over 35 knots. Fortunately, it was a quick moving storm and within an hour, it had passed us by. We did hear over the radio what sounded like one boat being knocked down (mast hitting the water), but fortunately no injuries or damage were reported. The rest of the race along the coast and around Montauk Point turned out to be uneventful. As we made the turn around the Point it was time to make the decision on the best way to enter Long Island Sound. The shortest route to the finish line would be to go through Plum Gut, approximately 17 miles northwest of the Point. The quickest way into the Sound is through the Race (so named because the currents can race up to 4 knots through here) which is about 13 miles from Montauk Point. In between the two is a channel between Plum Island and Gull Island. The tactical challenge is to enter the Sound as quickly as possible, but not to be caught by dying winds in the evening with the current reversing. We chose the channel between Plum and Gull Islands while our rivals split between the Race and Plum Gut. With night approaching and the currents flushing us into the Sound, we headed as quickly as we could down the middle of the Sound hoping to reach a shoal (28 Foot Shoal) where we could drop anchor if the wind died. Alas, that was not to be! Just a few miles from the shoal, the wind died completely, and the water at 170 feet was too deep to drop anchor. So close, yet so far! At the mercy of the currents and with no wind to fill the sails, it was a long painful night as we were swept back nearly 15 miles before the currents reversed and eventually brought us back into Long Island Sound. Early in the morning with the sun slowly rising, the winds finally filled in again and we had a great run the rest of the day westward down the Sound – until Northport. With evening approaching again, the wind – in typical summer Long Island Sound fashion – began to die off. As we slowed to a crawl, the contest between the two watches became one of which would pass the four smokestacks at Northport first. I should mention that at the time the contest began, we were almost even with the four smokestacks, making it a race of less than half a mile! I think it was two watches later (six hours) before Paul’s watch could declare victory. Unfortunately, the light wind continued to tease us Sunday morning, providing an occasional puff of three to four knots before dying out again. With a high pressure system parked over us and no change in wind expected for the next 24 hours, I decided to end our race this year. At that point, we had traveled just 3.2 miles in 14 hours! This entry was posted in Ocean Racing and tagged ALIR, Around Long Island Race, Montauk on August 10, 2015 by Greg Kyle (ChefonaBoat). This year, in addition to the Annapolis to Newport Race and the upcoming Around Long Island Regatta, I decided to sail Sedna, my Hunter 45cc, in the Marblehead to Halifax Ocean Race. Since growing up in Western Canada (and avidly reading Farley Mowat) it has been one of my long-time goals to sail around the Canadian Maritime provinces in general, and the rustic Nova Scotia coastline in particular. The 365 mile ocean race is considered one of the oldest ocean races in the world, with a history that began in 1905, predating the Newport Bermuda, Fastnet and Sydney Hobart Races. The race originally started as an informal competition between the Boston, Eastern and New York Yacht Clubs run sporadically between 1905-1939 and then biennially since then. The race starts just outside of Marblehead, MA (near Boston) and runs 260 miles across the open ocean of the Gulf of Maine before rounding Brazil Rock (a shoal off the southern tip of Nova Scotia) and heading 105 miles up the rugged – and often foggy – Nova Scotia coastline to Halifax. One of the things that make this ocean race unique are the fast currents that flow around the tip of Nova Scotia and into the Bay of Fundy which is home to one of the largest tidal ranges in the world – up to 54 feet! Miscalculate the tides around Brazil Rock and a boat can find itself being swiftly sucked up into the Bay, bringing a quick end to the race. This race was several years in the wishing stage for me, and I was very excited to finally make it to Marblehead this year for the start of this classic ocean race. Adding to the excitement was having my younger brother, Martin join me after many years of inviting him on my various ocean sails. Although not a sailor, he is an avid adventurer, spending many years sea kayaking and hiking on the coast of British Columbia. Also racing with Sedna was Susan Paul and Owen McDermott. The weather forecast on the day of the race looked generally good with fair winds and clear skies expected for most of the ocean crossing. The only concern was that the winds were expected to eventually turn light to variable which added to the stress of navigation and tactics. Following the rhumb line from Marblehead to Brazil Rock is the shortest course, but if the wind dies and the current begins to flow into the Bay of Fundy, then we could get quickly swept up into the Bay, and it’s race over. If we head further south, it adds extra distance to the race, but lessens the chance of being swept into the Bay of Fundy. All in all, it was a great trip across the Gulf of Maine with clear skies day and night. What made the trip particularly spectacular was all the aquatic wildlife we saw. Dolphins, whales and sunfish were in abundance, and at one point my brother and I counted at least eight whales in a 15 minute span. What a beautiful sight! The award for the most unusual or unique sight though, goes to the giant ocean sunfish. Prior to actually seeing these fish, we would often see fins break the surface and appear to lazily wave at us. Not seeing ocean sunfish before, I had no idea what to expect. Needless to say I was quite surprised at how odd they looked. These sunfish were between five and six feet long and it seemed as if half of their body was missing after the dorsal fin. The one pictured came up to within 10 feet of the boat and just hung around with us for about half an hour. As we approached the southern tip of Nova Scotia the fog began to build and before too long, we were surrounded by what could only be described as pea soup fog. At times it was even a challenge to see the bow of the boat. Adding to the stress, we had to pass through a fishing fleet off of Cape Sable and only a few of the boats showed up on AIS (Automatic Identification System). The others had to be found with radar. Fishing boats do not often trawl in a straight line, but instead make a series of turns which make it a challenge to avoid. Despite the fog and cold, it was a good 110 mile run up the southern coast of Nova Scotia with southerly winds of around 15-20 knots and four foot swells. As we approached Halifax Harbor during the night the fog finally lifted, unfortunately, the wind also died just 10 miles from the finish line. With 3-4 foot swells left over from earlier and no wind, the boat rocked from side to side with the sails either hanging listlessly or banging to and fro every time the boat was rocked by a wave. Feeling frustrated by the lack of progress we were making to the finish line, I decided to try to use my spinnaker in the light to non-existent winds. That was a bad mistake!! After hoisting it from the pitching bow, the boat rocked again and wrapped the spinnaker around the jib and forestay. Another roll and a puff of wind to partially fill the spinnaker and it wrapped around again even tighter. Ugh!!! It took 45 minutes and having to cut the dousing line to finally free it. But, what a relief to see the spinnaker finally drop down to the deck! The rest of the night and next morning was a painful crawl to the finish line as the wind remained light and the current began to reverse its flow, threatening to sweep us back out to sea. But, we persevered and finally crossed the line after 365 miles racing across the open ocean and up the foggy, rugged coast of Nova Scotia. P.S. Having the distinction of being the last boat to cross the line, Sedna was the proud “winner” of the ‘prestigious’ Cook’s Plate. This trophy is presumably given to the last boat to finish as the cook on board has to work the longest. When asked if I was happy to receive this award I answered unequivocally “Yes!” It was my first Marblehead to Halifax Ocean Race, a race I have wanted to participate in for many many years, and I had not only successfully completed it without ending up in the Bay of Fundy, but had done it with my younger brother, Martin. This entry was posted in Ocean Racing and tagged Cook's Plate, Marblehead to Halifax Ocean Race, MHOR, Nova Scotia, ocean racing on August 6, 2015 by Greg Kyle (ChefonaBoat). I was really excited to be back in Annapolis for the start of the Annapolis to Newport race. I find the city a vibrant, exciting place with a long history steeped in maritime tradition. Sailing seems to be a passion here and it vies to be the sailing capital of the U.S. Along with my regular crew, Paul, Susan and Amir, we invited some of the tenants from Liberty Landing Marina to sail with us on this iconic North American ocean race. Joining us were Marcus Ansell, Jeremy Nash and Moochie Corrado, all avid sailors keen to try their hand at sailing/racing on the open ocean. For this race I’m thankful for my sponsors who have been very supportive this season. Suntex Marinas was helpful in getting the boat ready for the race back at Liberty Landing Marina, its flagship property, and Liberty House Restaurant, part of Landmark Hospitality, provided some delicious veal and portobello mushroom meatloaf with mashed potatoes and gravy for some of our meals (there was so much delicious meatloaf!). I should add that Amir was a rock star in the galley. Even when the boat was heeled (leaned) over 25-30 degrees, he was happily preparing meals for everybody. On the day of the race start, the weather forecast looked good with 15-20 knots out of the northeast. This would make for a great 120-mile run down the Chesapeake from the start off Annapolis to the mouth of the Chesapeake Bay near Norfolk, Virginia. This year the race was set up with two race starts on separate days, the performance cruising boats started on Thursday, while the faster racing boats (like the 80-ft maxi, Donnybrook) started on Friday. The Thursday start was also different this year in that roughly 30 boats would all be starting at the same time. That made for a very exciting start, with all the boats tacking (turning) very close to each other trying to position themselves for a quick start at the front of the pack. We had a good start and with the spinnaker flying and were quickly sailing south towards the mouth of the Chesapeake, making over 8 knots at times. There were some challenges sailing in the Chesapeake, besides helming at night without the moon or stars or other external visual references to steer towards. The first challenge is the timing and location of currents which could significantly reduce our boat speed if miscalculated. Second, is the heavy commercial shipping traffic (tugs and barges, freighters, tankers, etc) which need to be avoided. These ships travel quickly through the shipping channels and you do not want to be crossing closely in front of them! Third, are the fish traps – some marked on charts, others not – which are a hazard at night. The fish traps are a series of poles with nets stretched between them, often without working lights to show their location. You do not want to get caught up in these! In spite of those challenges, we safely and quickly navigated down the Chesapeake and by 0600 Friday morning we crossed the Bay Bridge Tunnel in fog and headed out into the open ocean for the next part of the race – a 330-mile beat (upwind sailing) to Newport. Before we were out of cell phone range from land I grabbed the latest weather forecast, and that forecast was not good! The new forecast called for 26-32 knot winds right on the nose with 10-15 foot seas by Saturday night. Because it would be on the nose, it would be a rough, rough pounding in the waves with apparent winds in the 35-40 knot range. To put it mildly, that would not be pleasant. In reviewing the forecast, the winds did look lighter if we stayed closer to land but that would add extra miles to the route. Deciding to put the safety of crew and boat first, I opted for the longer, but safer route closer to shore. However, before we headed on our new route to Newport, we had a nice surprise waiting for us. Shortly after we rounded a navigational aid which marked the turn to Newport eight miles offshore, Susan, who was at the helm, shouted that the boat had suddenly stopped! I ran up from down below wondering if we had grounded or got caught in a fishing net. We hadn’t grounded as we were in 45 feet of water, and I couldn’t see fishing nets under the boat, so that didn’t appear to be the cause. Then Amir noticed that the anchor had dropped and was holding us fast! Apparently the force of the waves crashing against the bow had knocked the pin holding the anchor out. And, because I had forgotten to ensure it was lashed down (big learning experience for me!) the anchor was free to drop with all 220 feet of chain and rode running out. It was a tense half hour, as Amir and Paul struggled to bring the anchor back onto the boat. In the middle of raising the anchor, another sailboat, one of our competitors, emerged out of the fog and heading toward us. Fortunately, the crew saw us and quickly changed their heading. They must have wondered what we were doing with our sails up but going nowhere! The rest of the day was uneventful as we settled down into our watches, and continued our race towards Newport. Saturday was a mixed day. It started out with more fog and just a light breeze. Eventually the wind picked up as thunderstorms built up around us. Fortunately, the storms passed on both sides of us, saving us from strong squall conditions. I found out after the race, that some boats which went further east were hit with +50 knot winds, and one boat was knocked down (mast in the water) and had its hard dodger ripped off by the strong gusts! Several others had their mainsails ripped by the winds. We had another small adventure – this time positive – on Saturday when Jeremy decided to try his hand at fishing. It didn’t take long, and within fifteen minutes he proudly caught a fish, the first time one was landed on my boat. By 1830 on Saturday, the clouds cleared and the late setting sun came out, promising a clear night full of stars. This was a nice change from the previous nights of dark skies and constant fog and mist, water dripping off our eyebrows. The rest of the race to Newport was smooth sailing and everybody was happy to have a watch under the beautiful night sky with the stars shining brightly overhead. The rising moon late at night was also a stunning sight as it slowly lifted above the horizon. It also helped that we had some delicious left over meatloaf sandwiches to enjoy during the wee hours of the morning! Thanks again to Ken Trickilo, the executive chef at Liberty House Restaurant. The early morning sunrises were also a sight to behold. During the following two days, we were fortunate to see dolphins and sea turtles swimming around us. We even passed a few large Portuguese man o’ war jellyfish. One sight that caught those of us up on deck by surprise, was a picnic table floating leisurely far from land with a bird perched on it as if waiting for crumbs. Rounding Block Island, all the crew came up on deck for the last sail into Newport and the finish off Castle Hill Light. It was an exciting time to finally cross the line after 460-miles and the crew burst out in loud cheers! Four and a half days with seven sleep-deprived people on a small boat, sounds like a recipe for conflicts and short tempers. But, that was not at all the case. In fact, it was quite the opposite, and I was very happy with the camaraderie and the positive attitude had by all. I hope everyone came away with a sense of wonder and excitement that ocean sailing/racing can bring. P.S. – It was sad news to hear that a great, kind person and excellent sailor at Liberty Landing Marina, passed away shortly after we returned. Seymour Friedel will be warmly remembered for the smile he brought to our hearts and the joy he had for being on the water. This entry was posted in Ocean Racing and tagged A2N, Annapolis, Annapolis to Newport Race, Block Island, Newport, ocean racing, Suntex on June 16, 2015 by Greg Kyle (ChefonaBoat). People sometimes joke that with my Hunter 45cc, I have a “racing condo.” To an extent, that’s true. It is a fast, mid-price production boat loaded down with all the creature comforts which many people look for in a boat. That includes a comfortable layout with wonderful dockside amenities which include air conditioning, a couple large flat screen TVs, stereo, microwave, espresso machine and more. It really does feel like an apartment (albeit, NYC-sized) on the water. Yet, I like to race Sedna and show sailboat owners that getting out and racing on the open ocean is attainable for many people with standard production boats, it’s not just for specialized racing boats. Granted, there is some preparation that is important for getting one’s boat and crew ready for offshore sailing/racing but it is easily achievable and well worth the effort. The excitement and sense of adventure that sailing on the open ocean brings can be so rewarding! I always smile when one of my crew experience something new. Whether it is a crystal clear night with the stars shining in abundance without the glare of city lights, the golden glow of the sun slowly rising above the horizon at dawn, seeing whales, dolphins and sea turtles swimming alongside the boat, or bio-luminescence glowing in the water during the night watch, it’s moments like those that are cherished. In getting the boat ready for the upcoming Annapolis to Newport Race, I worked with the service yard at Liberty Landing Marina, Suntex Marina’s flagship marina. I was very happy with how quickly Dan the service manager arranged to have someone down to my boat to troubleshoot issues. Chuck from service was able to find the source of new house batteries not charging, a great relief before we left on a 800 mile round trip sail. 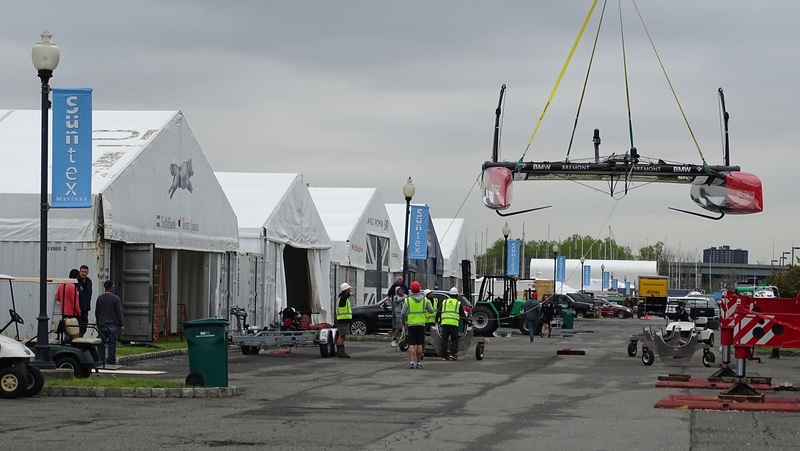 The service yard was also quite helpful in getting the rig checked before the race. All too soon, it’s time to head to Annapolis for the start of the race, where we will be proudly flying the Suntex Marina flag. Check back for an upcoming post detailing the excitement of the Annapolis to Newport Race. This entry was posted in Ocean Racing and tagged hunter45cc, ocean racing, racing condo, suntex racing on June 14, 2015 by Greg Kyle (ChefonaBoat).